South Korea's unification minister left for the United States on Tuesday for a five-day visit amid speculation over possible differences between the two allies over how to achieve North Korea's denuclearization. 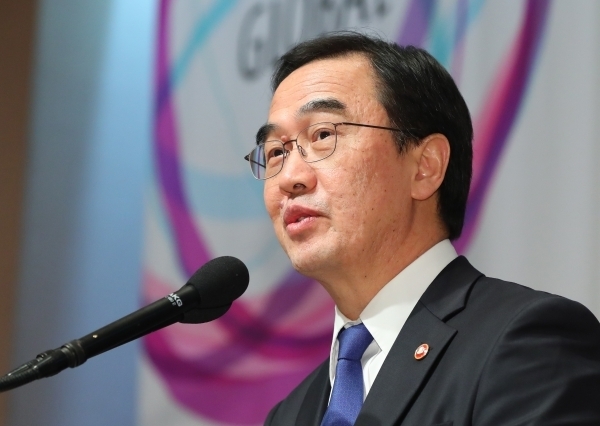 Minister Cho Myoung-gyon is likely to meet Secretary of State Mike Pompeo and other officials and experts to discuss issues of the North's denuclearization and inter-Korean relations, the ministry said. "This is a meaningful trip that comes at a very important time," Cho told reporters before boarding a plane bound for the US at Incheon International Airport, west of Seoul. "In Washington and New York, I will meet government and parliamentary officials, and many other experts to discuss the denuclearization of the Korean Peninsula and the establishment of peace," he added. His trip comes amid apparent friction between the allies over how to enforce global sanctions imposed on North Korea amid almost stalled denuclearization talks. Joint projects between South and North Korea, such as railway and road connections over their border, have been faced with apparent opposition from the US On Monday, the two Koreas held a meeting but failed to produce dates for joint surveys of their roads, which are needed for their connection as agreed upon in a summit in April. Cho will likely emphasize Seoul's argument that an improvement in inter-Korean relations could benefit the denuclearization process and ask the US to cooperate in easing sanctions on key cross-border projects. During his five-day stay, Cho is also expected to meet Rep. Ed Royce, chairman of the House Foreign Affairs Committee, and visit the Center for Strategic and International Studies and other institutes to meet local experts on North Korea.